How does it differ from manual air-con? Climate control automatically maintains a desired temperature within the car’s cabin by continuously adjusting the air-con and heater settings. Using a number of sensors, the climate control system constantly measures the cabin air temperature. From this, it can work out how cold or hot the air being pumped into the cabin needs to be in order to maintain the desired temperature that's been set by the driver. Other parameters which the system may adjust are fan speed and recirculation settings (whether fresh air from outside or recirculated air is pumped into the cabin). A lot of cars now have dual- or tri-zone (sometimes called multi-zone) climate control where the car is able to maintain two or three separate temperature zones. For example, the driver could have their climate control zone set to 23 degrees, the passenger’s at 18 degrees and those in the back of the car at 25 degrees. 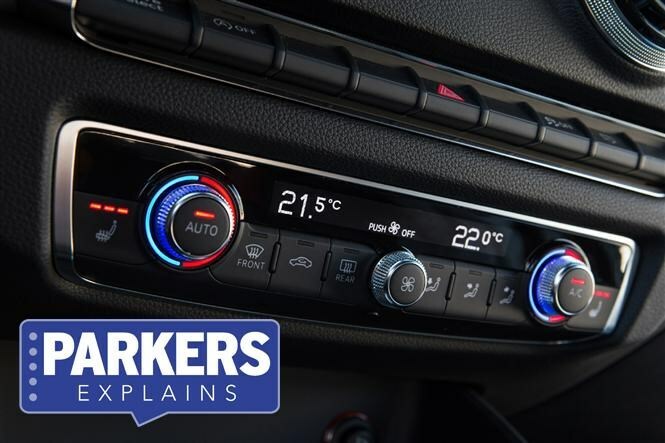 What’s the difference between manual air-con and climate control? Manual air-con is capable of blowing hot and cold air into the cabin at a temperature and ferocity desired by the occupants. However, unlike climate control it cannot maintain a set cabin temperature automatically. Instead, the vehicle’s occupants must manually adjust air temperature and fan settings in order to keep the cabin climate at a specific level. It’s a very useful piece of technology and you may find that once you’ve used it, you won’t want to go back to conventional manual air-con. Single or dual-zone climate control is available on just about every car on sale, while tri-zone climate control is the reserve of larger or more luxurious premium vehicles. Dual-zone climate control, tri-zone climate control, multi-zone climate control.